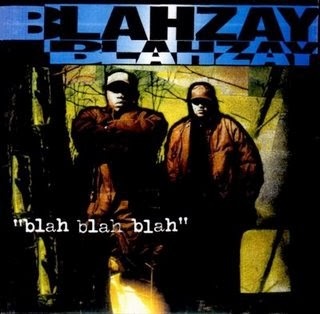 So here's what I know about Blahzay Blahzay: they were a Long Island, New York duo comprised of producer DJ PF Cuttin and rapper MC Out Loud and dropped one album, the title of which could accurately describe what rappers have to say nowadays (Blah, Blah, Blah). Blahzay Blahzay burst upon the scene in 1995 when they released their hit single "Danger," and in '96, their debut album hit the shelves. After that, though, they were never heard from as a duo again. PF Cuttin still produces (he is actually tight with Sean Price), and I'm sure Out Loud is doing some rapping somewhere. However, as far as Blahzay Blahzay is concerned, the group is defunct (or, at the very least, in a very, very long period of dormancy). I won't pretend to know anything else about this duo, because, well, I don't. Still, Blah, Blah, Blah has been hailed as an underground gem by some. Let's see how much weight that praise holds. The first actual song on the album freaking knocks. PF Cuttin's beat consists of some banging drums and a sparse piano sample, and Out Loud does a fine job ripping it, especially with his "females feel it in their ovaries" line. The instrumental carries on by itself for the final minute-and-a-half or so, and while I normally cringe when that happens, I actually didn't mind it this time. This title track is just an all-around great record. This short skit, which utilizes Dr. Dre's "Nuthin' But a G Thang" beat for all of 14 seconds, was kind of a West Coast diss. Too bad Blahzay Blahzay didn't have enough of a following for it to make any sort of dent. The sequel to the aforementioned hit single. I'm not sure why this comes before the original in the tracklisting, but who cares? This absolutely bangs. You've gotta love PF Cuttin's dusty drums, and the light sample is awesome. Trigger Tha Gambler, Dark Man (who, contrary to popular belief, is not La The Darkman; just listen to his verse, for God's sake; sounds nothing like La) and Smoothe Da Hustler all drop by to apply guest verses. They all tear it to bits, too, with Smoothe walking away the victor. This is fantastic. The first misstep. The organ sample that PF Cuttin utilizes just isn't all that palatable, and not even a solid performance on the mic by Out Loud can save it. It doesn't help that this runs nearly six freaking minutes long, either. Ah, back on the right track. Much like the first two actual cuts on Blah, Blah, Blah, "Pain I Feel" (which was the album's second single) rocks. PF Cuttin's production is both hard and soulful at the same time, and Out Loud absolutely shreds it, even if he doesn't actually talk about the pain he feels at any point of the song (unless I missed something). The first thing I noticed about this track is how guest artist Mental Magician sounds like a combination of Smoothe Da Hustler and Top Dog from Originoo Gunn Clappaz. Anyway, the PF Cuttin beat is a bit repetitive, but it isn't bad, and Out Loud, Mental Magician and Dark Man (once again, not La) all do it justice. Decent record, even if it runs a bit too long. One thing you'll notice about PF Cuttin's instrumentals is how consistently dusty his drums are, and that's always a positive. He integrates some pretty dope vocal samples into his productions, too, which is also a plus. Out Loud engages in some pretty vivid storytelling here, showcasing his versatility as a rapper and making you wonder why his career never really took off. This cut just isn't able to match the energy level of much of the rest of the album. That's all I've got. Mental Magician (who I really like) is here again, and Verbal Fist (who also sounds like Top Dog; what the hell is going on here?) and Verbal Hoods join him and Out Loud over the simple PF Cuttin beat. In the end, "Long Winded" just isn't all that impressive and is exactly what its title says. Believe it or not, "Jackpot" is the first song on Blah, Blah, Blah that clocks in at under four minutes long. That doesn't mean it's any good, though, as this is nothing more than average. It's more boring than anything else, but hey; it's short, so that counts for something. The aforementioned single, and I can definitely see why it was such a hit: it's entertaining as hell. Oddly enough, this wasn't produced by PF Cuttin. Domingo is on the boards here, and his instrumental (which contains a vocal sample from Jeru The Damaja's famous track "Come Clean") is actually somewhat goofy while still being extremely effective, and Out Loud blesses it properly. Even if I do like the sequel better, "Danger" is still pretty freaking good. Blah, Blah, Blah isn't a classic album, as there are too many dull songs on it for me to give it that label. Still, this was a fairly entertaining listen, and like I say about a lot of other overlooked '90s projects, the best tracks on here are really good. You will likely be impressed with MC Out Loud's ability on the mic; he sounds like Superman in the booth on quite a few of these records. He is able to easily match his delivery to the flow of PF Cuttin's beats, and he is actually a very solid lyricist on top of that. Many of you will also find a lot to like in PF Cuttin's instrumentals, especially if you're a fan of artists like the Wu-Tang Clan. As I said numerous times in the review, his drums are very dusty and grimy, and his samples are generally sparse enough where they don't interfere with the rapping. That being said, quite a few of PF Cuttin's productions on Blah, Blah, Blah were rather boring, and the worst part about that is the fact that most of them were also really long. There was absolutely no reason why some of the cuts on this album had to be over five minutes long, especially when the final two minutes or so of the songs consisted of the beat playing out until the end. All things considered, this is a solid piece of work that absolutely deserves a listen. Out Loud warrants some attention as an MC, and PF Cuttin is certainly worthy of some praise as a producer, even if he laid some clunkers on here.